There’s a thrill that many people get when they see an all-star game. There’s an excitement when people see players showcase their skills. For the players, there was an opportunity to show what they could do on the court without having to abide by plays. 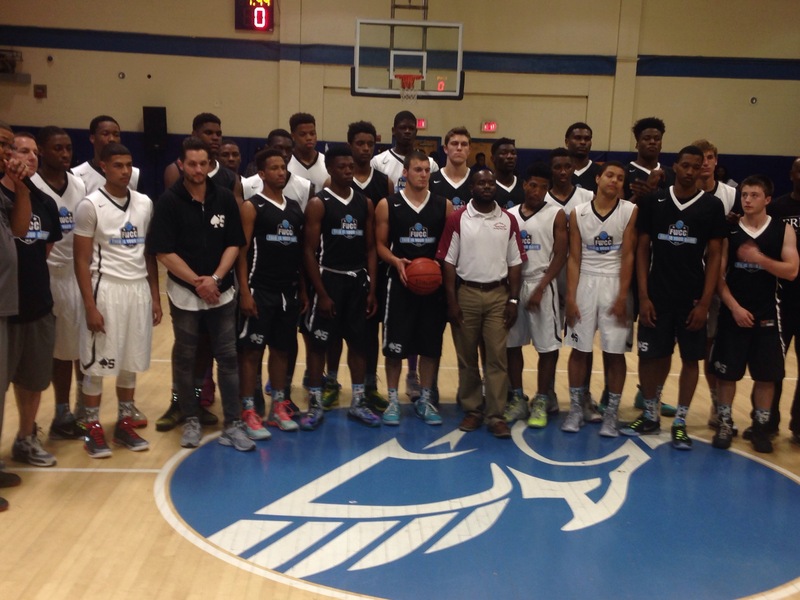 In this year’s Frankie Williams Charity Classic, there was plenty of opportunity for many of the players to show out. The FWCC, which was held in Greenburgh, NY, was in its 6th year of existence and had plenty of Division I talent in the gym. Team Aces defeated Team Action, 125-123, in a game that was truly a classic. The Patrick School (NJ) junior Bryce Aiken put on an MVP performance with 28 points and MacDuffie School (MA) junior Unique McLean also put on a highlight-reel performance with 32 points, many of them coming off of emphatic dunks. Iona Prep (NY) senior Matt Ryan, bound for Notre Dame, put on a show with 26 points and won the sportsmanship award for the losing team. Other players who made their presence felt were Sunrise Christian Academy (KS) senior Dupree McBrayer, the Minnesota commit, who scored 18 points, Victory Rock Prep (FL) senior Jonathan Nwankwo, who scored 18 points and St. Thomas More Prep (CT) senior Steve Enoch, bound for UConn, who scored 16 points and was a beast in the low post. All in all, the Frankie Williams Charity Classic was a tremendous event that had great music, a great atmosphere and a great turnout from the people of Westchester County. The event was nothing short of spectacular as it brought out not only the best talent from around the country and New York City, but also the best from Westchester County in players such as Walter King of Lee Academy, who is committed to Maine, Rickey McGill of Spring Valley, who is committed to Iona and Elijah Hughes, a junior at John F. Kennedy Catholic High School. Last night’s game proved that the FWCC is a premier event that will only get better and better. Jonathan Nwankwo, Victory Rock Prep School (FL), Class of 2015 – Nwankwo is powerful in the paint. He is very strong and athletic and knows how to rebound with proficiency. Dupree McBrayer, Sunrise Christian Academy (KS), Class of 2015 – McBrayer is a guard/forward that has a good ball handling skills, can make good moves to the basket and is adept at scoring from many places on the court. He will be headed to the University of Minnesota in the fall. Kylan Guerra, Archbishop Stepinac (NY), Class of 2015 – Guerra is a point guard that is quick and deceptive with the ball and also knows how to score when needed to as well as set up his teammates for baskets. Matt Ryan, Iona Prep (NY), Class of 2015 – Ryan is a skilled forward that can shoot and also move well off the ball. He can also score in bunches and attack the basket with authority. He also is a good rebounder. He will be headed to the University of Notre Dame in the fall. Bryce Aiken, Patrick School (NJ), Class of 2016 – Aiken is a heady little guard who can shoot as well as distribute to his teammates. He can also cross over his opponents with precision. He holds offers from Rhode Island, Florida State, Yale, Harvard, Bulter, Oklahoma, Rutgers, Seton Hall, LaSalle, Delaware, Detroit, Manhattan, St. Francis (NY), Auburn, Buffalo, Miami (FL), South Florida, Creighton, Hofstra, Maryland and Illinois. Mohammed Bamba, Westtown School (PA), Class of 2017 – Bamba is a dominant presence around the paint and can be aggressive when going to the rim. He also has a good handle for a big and can rebound efficiently as well as shoot from long range. He holds offers from UConn, Syracuse, Arizona, Seton Hall, Florida State, Kansas, Georgia Tech, Providence, Wake Forest, West Virginia, Seton Hall, Villanova, Maryland, Arizona State, Texas, James Madison, Penn State, Yale, Temple and Rice. Unique McLean, MacDuffie School (MA), Class of 2016 – McLean is an explosive guard that can find his way to the basket with ease, but can also shoot. He is mainly known for his highlight-reel dunks. He holds offers from Bowling Green, Siena, Detroit, Dayton, St. Francis (NY), Rhode Island, St. Peter’s, Rutgers, Manhattan, James Madison, Fordham, Fairfield, Iona, Duquesne and UMass. Steve Enoch, St. Thomas More Prep (CT), Class of 2015 – Enoch is very quick for a big man. He is aggressive in the paint and has handle. He is also a beast in the paint. He will be headed to the University of Connecticut in the fall. Nakye Sanders, Tottenville (NY), Class of 2015 – Sanders is a big that can handle the ball. He also finds plenty of ways to score. He will be headed to Duquesne University in the fall. Ian Gardener, St. Thomas More Prep (CT), Class of 2015 – Gardener is a good passer and is also explosive when going to the rim. He will be headed to Gannon University in the fall. Jordan Ruillano, Victory Rock Prep School (FL), Class of 2015 – Ruillano is a good lead guard with handle and can shoot from any place on the court. Walter King, Lee Academy (ME), Class of 2015 – King is a guard that can shoot and find ways to score. He will be headed to the University of Maine in the fall. Connor McGuinness, Clarkstown South (NY), Class of 2015 – McGuinness is an efficient shooter and a pure point guard who knows how to run a team. He will be headed to Pace University in the fall. Lenny Kadisha, Wadleigh (NY), Class of 2015 – Kadisha is a guard that can score anywhere on the floor and play solid defense. Christian Vital, St. Thomas More Prep (CT), Class of 2016 – Vital is an athletic guard who can attack the basket. He holds from Chattanooga, Boston College, Northeastern, George Mason, St. Peter’s, VCU, St. Joseph’s, Fairfield, Fordham, Tulsa, Duquesne, LaSalle, Hofstra and Rhode Island. Pierre Lys, Woodlands (NY), Class of 2016 – Lys is an adept ball-handler who can also shoot. Elijah Hughes, John F. Kennedy Catholic (NY), Class of 2016 – Hughes is an athletic guard with a good shooting touch. He finds many ways to score and also rebound. He holds offers from Iona and Fairfield. Rickey McGill, Spring Valley (NY), Class of 2015 – McGill is a quick and deceptive guard that can score in bunches. He will be headed to Iona College in the fall. Isiah Deas, Thomas Jefferson (NY), Class of 2016 – Deas is a tough guard with a lot of heart and is a superb three point-shooter. His shooting skill set is tremendous.